My Oh My!!! The M's complete a sweep of the San Diego Padres with a stellar performance by Felix Hernandez. Felix gave up one run in 8 complete innings giving up 6 hits and striking out 13 batters. That matches a career high in strikeouts for him. Even more of a story on the day were the bats of every player on the Seattle Mariners, with the exception of Felix, but, that's to be expected. The M's broke off all expectations today by striking 15 hits and scoring 6 runs. Carlos Peguero hit a monster shot in the top of the third that was just inches away from clearing the fence. 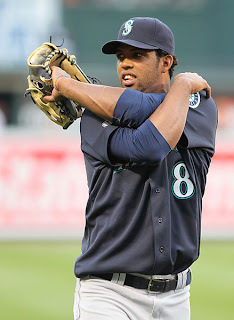 That put the M's up 3 - 0 which proved to be enough for Felix. Peguero had two hits on the day and continues to swing the bat well as of late. Brendan Ryan continued to have a hot bat and did a tremendous job stretching a single into a double late in the game. Olivo got a stolen base. All around, the M's looked today like a team that is ready to get to the playoffs. I know we swept the Padres which isn't too much to write home about, but who else is sweeping the Padres? Who else is completely shutting down every team they face? No one! As a fan it's hard to believe that we are here. I cannot believe that we are a game and a half out and on a five game winning streak. There is only a bright future ahead as we start to put together decent hit streaks and our pitchers continue to shut the door on other teams. The new kids, Mike Wilson and Carlos Peguero are bringing some life to the party and it's exciting to watch. David Pauley came out in the ninth and put away the Padres for good and sent the M's on their way to Minnesota on a high note. As the M's face a team that continues to struggle in the AL Central, the Rangers will play the Whitesox who have won 7 of their last 10 games while the Angels and the A's play against eachother. So, if the M's continue to play as they have been, not only will the M's guarantee themselves out of last place, but may find themselves riding this wave to first place! Way to go FELIX, you are King! Hitters, get your sock covers on those bats - gotta keep them hot!! !